After several months in public and then private alpha and beta testing, Tweetbot for Mac has been released for $20 [App Store]. The app includes support for the Retina MacBook Pro, iCloud syncing with the iOS versions of Tweetbot, and more. There are also a number of excellent reviews out today to help users decide if the app is worth $20, including from The Verge, The Next Web, and MacStories. Why is Tweetbot for Mac $20? If you think about it, it’s not that expensive. Twenty dollars for a quality piece of software that you use every day? That has been the price point for quality utility apps on the Mac for years. However, it’s not just the development time and attention we put into the app that commands the higher price. Because of Twitter’s recent enforcement of token limits, we only have a limited number of tokens available for Tweetbot for Mac. These tokens dictate how many users Tweetbot for Mac can have. The app’s limit is separate from, but much smaller than, the limit for Tweetbot for iOS. Once we use up the tokens granted to us by Twitter, we will no longer be able to sell the app to new users. 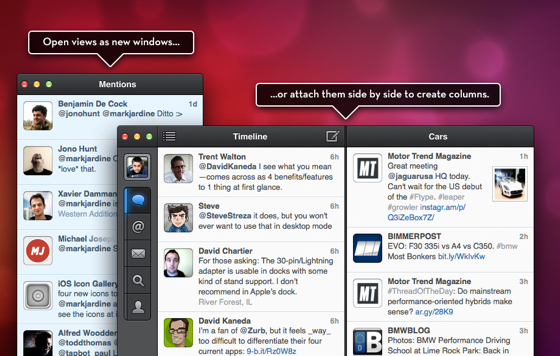 Tapbots will continue to support Tweetbot for Mac for existing customers at that time. This limit and our desire to continue to support the app once we sell out is why we’ve priced Tweetbot for Mac a little higher than we’d like. It’s the best thing we can do for the long term viability of the product. We know some will not be happy about Tweetbot for Mac’s pricing, but the bottom line is Twitter needs to provide us with more tokens for us to be able to sell at a lower the price. We spent a year developing this app and it’s the only way for us to be able to make our money back and continue supporting it with updates in the future. Feel free to let Twitter know how you feel about it. Spent $20 bucks last night for a pizza dinner.....gonna crap it out shortly. Think $20 bucks for a decent app that I use and is open all day is a steal! The price is a typo, right? That's outrageous! Hell, just go to the website for FREE! Another open tab won't hurt. to quote a friend, "5 bucks would be amazing. 10 would be doable. but 20? no way." i know Twitter is ridiculous for the token limiting. I hear what you're saying Tapbots, I really do. But, be realistic. I really enjoyed the app in beta, but am very disappointed in the price. You'd have to be insane to buy a Twitter app at that price. I love Tweetbot for iOS, but I really can't justify the price for this OS X app. Personally not paying $20 for a twitter app, nor will I be revoking my tokens. When the money grabbing stops and the price becomes reasonable, I'll buy it, but until then, the token stays on the several accounts I used during the betas. It's kids like you that ruin the playground for everyone. Couldn't agree more and it's exactly what I thought when I saw the price. I was already disappointed in them for releasing separate iPhone and iPad apps. Greed is good, I guess. Tempted to pirate the app out of spite. 5 pages of comments and still I see nothing about it!!!! What's gonna happen to Tweetbot once Twitter cracks down. It's already been stated that Tweetbot doesn't fit the requirements that Twitter is trying to evolve into. Twitter seems to want to put these changes into effect pretty quickly too. The entire Tweetbot experience relies on Twitter. So really whats gonna happen if I buy this? Twitter could crack down in 6 months - 1 year and reject Tweetbots access to Twitter's tweets. Then what, this $20 app loses ALL functionality? Don't get me wrong I loved the alpha and the iPhone app but I'm having a hard time justifying spending money on something that might not work in a year. I know they say they'll always continue support, but what will they be supporting if they can't show tweets? Maybe I'm still just a little bitter about buying Sparrow for iPhone & Mac the day before Google bought them. That is quite expensive considering I can use Twitter's web site or app for free. I think I'm going to pass. This would be better if it was clearer what's going to happen to 3rd party clients in the future. Unless Twitter has a change of heart, they will die based on economics alone. The reason Twitter has the amount of tokens it does is that it had an alpha before the rules came into effect. Going forward, clients are effectively dead. I'm going to buy this anyway because to me, Tweetbot is effectively twitter. The day Tweetbot stops working is the day I stop using Twitter. Tweetbot can blow me for $20.00. Twitter is such overrated BS for the criminally self- obsessed.